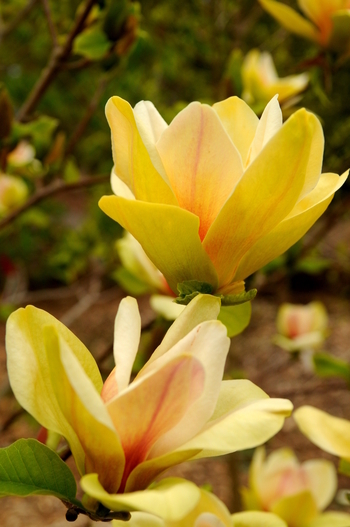 Honoring the former director of both Brooklyn Botanic Garden and Scott Arboretum, it's upright in form and has fragrant yellow and pink, tulip-shaped flowers. Always popular, so order early. With a RHS Award of Garden Merit Lois, named in 1998, is a sister to 'Elizabeth', with more intense yellow flowers consistently opening a couple weeks later so more flowers come after spring frosts but still prior to the leaves. The flowers don't fade with age though they are slightly smaller than Elizabeth's. Flowers of exceptional size, 10 inches, and perfect form and purity - rounded, sumptuous tepals which are cupped just right. Buds are pinky-lavender and open to palest pink white. It's a stunner to be sure, around since the 70's. 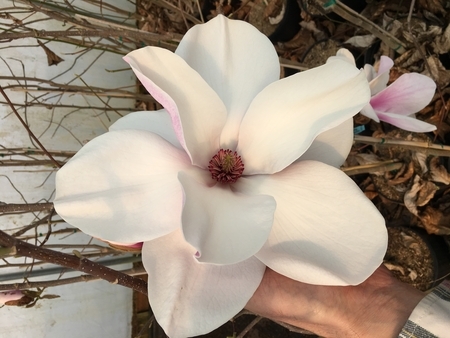 During the 2011 Magnolia Society meeting in Rhode Island, a majority of ladies in the crowd raved about this abundant bloomer with its rosy-accented flowers. It's a wonderful selection due to the warm color tones, blooming later than any of the other yellows and before the emergent leaves. August Kehr, the hybridizer, would have never accepted much credit for this plant he created, but he deserves all our thanks for his exceptional work, including this plant. Interesting story: On the way to see Augie from Raleigh, NC Pat McCracken and Mark Krautmann decided to accept August's invitation to name all of his (at that time, only numbered) superior yellows. Before we got to Hendersonville, where he and his wife lived, we came up with Stellar Acclaim, Sunsation, Solar Eclipse, Hot Flash, and Sunspire. Augie was too modest to name his own "children". Tinker Belle is a really beautiful Magnolia and we expect it to be in big demand. Fast growing it blooms well on young plants in the nursery. 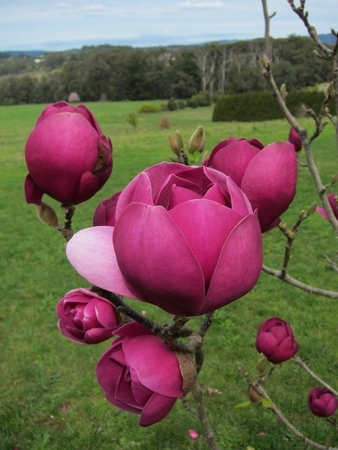 The buds open to numerous dark magenta, 3" upright flowers with pale pink interiors and a very sweet fragrance. Small in stature it will make an excellent specimen for smaller gardens, container culture or a shrubby boarder. The plants set buds readily in the nursery and the color and fragrance are unique attracting a lot of interest in the garden center. In Europe it is sought after for cut flower production. Spectacular large, ruby-red flowers and compact size characterize this trouble-free nursery plant. Even the large winter flower buds are ornamentally appealing with their distinctively thick protective covering of brownish gray "fur" to shield them from the cold. In full bloom, this short plant is un-rivaled for attractiveness because the blooms are so up easy to see up close. This tree has it all with dramatic, goblet-shaped blooms of black-purple, up to 6 in. across on quick-to-flower small trees. Larger growing, and with darker flowers than 'Genie'™. These flowers are by far the darkest colored of magnolia blooms. Their fragrance and dense presentation on small trees justifies planting Black Tulip® near doorways and paths. Bred in New Zealand by leading magnolia breeder Mark Jury, Burgundy Star™ has large (up to 5inch diameter) gorgeous claret red, lightly fragrant blooms which cover the tree in early Spring. They seems to be exceptionally long lasting and the color is stable. The blooms cluster along the stems all leading to a very luxuriant look. As a 10 year old tree it grows up to 11 feet in height and 11.5 feet wide. 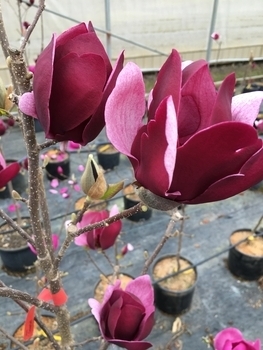 Bred in New Zealand by leading Magnolia breeders, Felix and Mark Jury, Magnolia Felix® is stunning. In early Spring the reward is a mass of magnificent, 12 inch large, open-faced hot pink flowers. 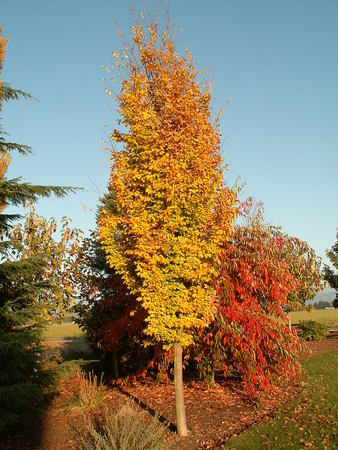 It is an upright smaller tree growing to a height of 16 feet, making it suitable for smaller gardens or featured in larger landscape plantings. 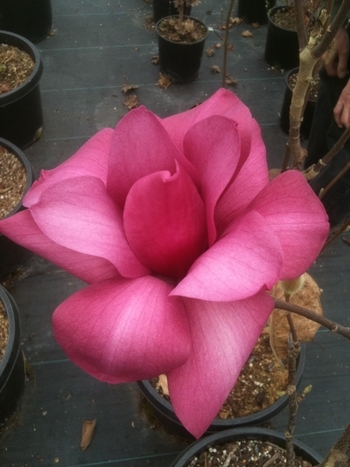 A stunning addition to Magnolia collections and another introduction from breeders Felix and Mark Judy. It produce magnificent, 6 inch golden-honey, goblet-shaped flowers almost tulip-like, in early spring. Honey Tulip is an upright smaller tree growing to a height of 12 feet, making it suitable for smaller gardens or featured in a larger landscape plantings. 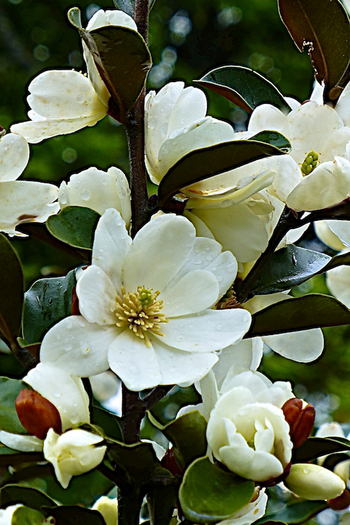 Fairy Magnolia™ Cream is a new hybrid Michelia bred to produce masses of beautiful fragrant creamy-white flowers in early spring. With a little more yunnanensis in the parentage Cream's flowers are more cup shaped. These plants are so free flowering that they have a flower bud at each leaf axil and have been known to provide a light flush of flowers during summer too. The plants are bushy with rich evergreen foliage, which makes them ideal in the garden as a flowering hedge or specimen plant. 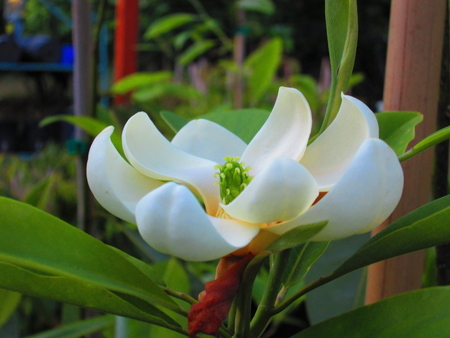 A new hybrid Michelia bred to produce masses of bright white flowers with intense fragrance in early spring. 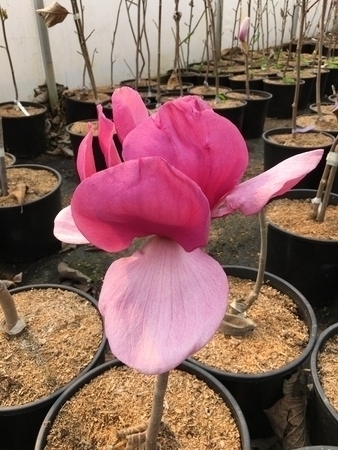 These plants are so free flowering that they have a flower bud at each leaf axil and have been known to provide a light flush of flowers during summer too. 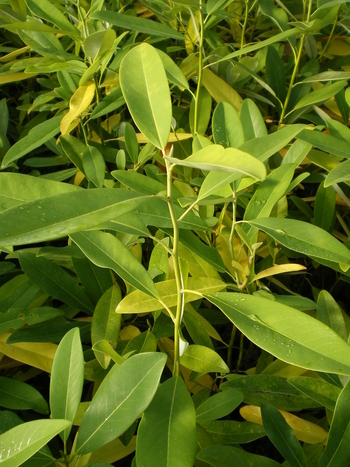 The plants are bushy with rich evergreen foliage, which makes them ideal in the garden as a flowering hedge or specimen plant. Tall than wide, 10' x 6'. Very hardy - the rootstock of choice for a rich selection of new hybrids. These liners have an extensive root system - a bonus for field planting or potting up. Very unique, this prostrate form only reaches 18-24 in. tall, but has a spread of 6-8 ft. Fragrant flowers are upward-facing and bloom prolifically from spring to early summer. 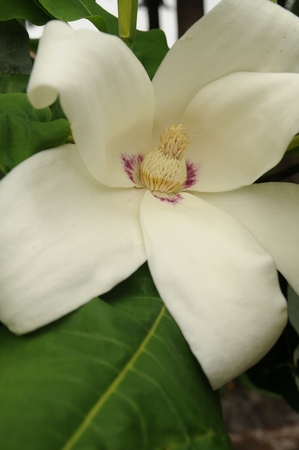 A far reaching "free spirited" evergreen with fragrant, magnolia-like flowers, Free Spirit is in a class of its own. 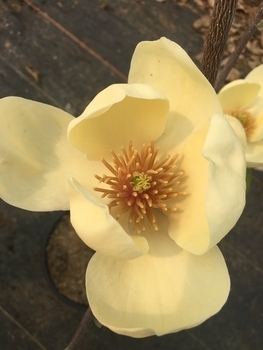 Can also be top grafted on Magnolia laevifolia, making one of the most striking standards in the plant world! An upright grower with a dense habit, Inspiration™ adds a vertical effect for those tight areas in your landscape. 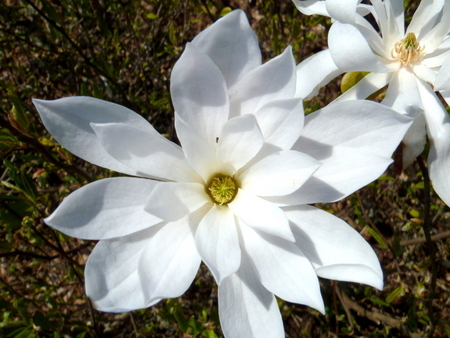 Sweetly scented porcelain-like flowers bloom in spring. Not as tall as the species, reaching 8-10 ft. at maturity. 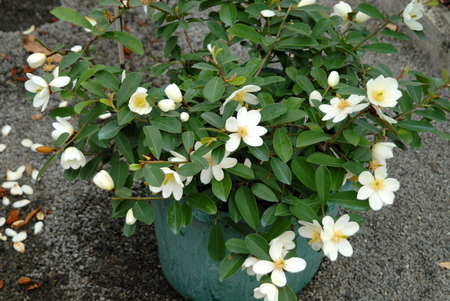 Imagine a 6-8 ft. evergreen shrub with a profusion of brown velvety buds that open to creamy-white, scented flowers. 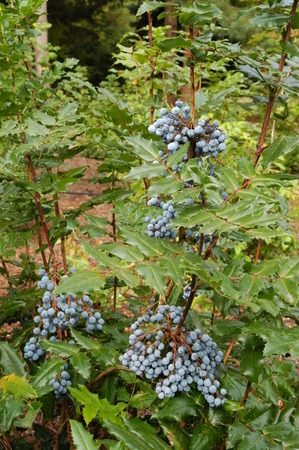 The dense habit of this variety puts it among the ranks of some of our favorite shrubs. Perfect for hedging. 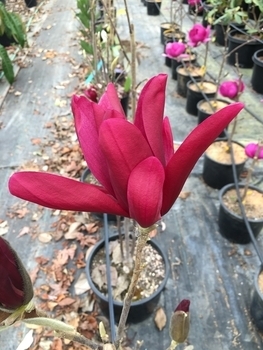 Bigleaf Magnolia appears tropical, but is surprisingly hardy. 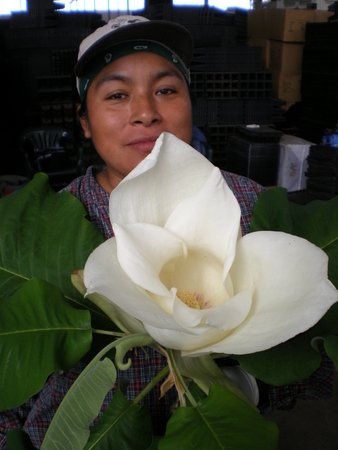 A medium to large native tree with huge leaves, impressive white flowers and decorative fruits. Scaled-down version of Magnolia macrophylla for the modern garden. A precocious bloomer, it sometimes buds up to yield a flower in a pot only 3 yrs. from seed. Fragrant flowers in June... what an early-evening close-up sight for tired eyes! Structurally, they're so fascinating, a delight for their delicate scent and always tempting to touch….reminds one of the biblical verse in praise of lilies "…Solomon in all his glory was never arrayed like one of these...” An 8 ft. multi-stem shrubby form in the Krautmann landscape produces 20 dinner plate-sized blooms over a 2-week period. For such ephemeral blooms, it's a wonder to contemplate that this plant and its cousins have populated the planet since before the dinosaurs perished. YOU NEED this plant, whether you realize it or not. Grow a few in your home garden where you can simply relish them with no prices on them. They are in fact, a priceless experience for any thoughtful nurseryman or gardener. This species is prized for its small stature and remarkably beautiful flowers. 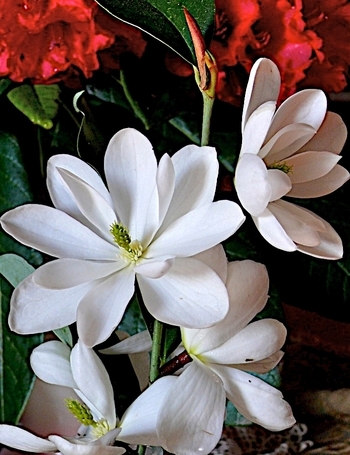 The fragrant, nodding white blooms are accented by red stamens. Since this is a small tree, close inspection of the flowers is easy - a true delight! Although most references list it as zones 6-8, it has proved hardy at the Minnesota Landscape Arboretum, growing successfully in a windy Zone 4. Tends to be pinker in bud than most, and quite hardy. It's a bushy upright tree, fragrant, and late blooming. Distinctive among magnolias for its shiny narrow leaves, dark green above and a downy white beneath. A refined small tree (best) or large multi-stemmed shrub if given a prominent place in the landscape where its wonderfully fragrant flowers can be appreciated. The extraordinary growth rate of this cultivar coupled with its precocious blooming character make it a lucrative item. 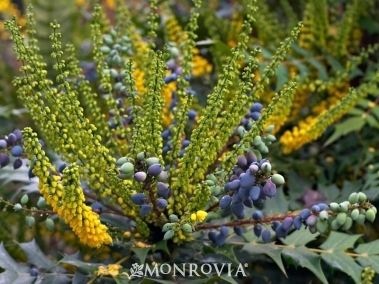 Moonglow® will grow to 5 ft. and bloom within 2-3 years. Selected and named by Earl Cully, this clone is surprisingly hardy to -33ºF. Lemon-fragrant blooms over a long period in late spring. 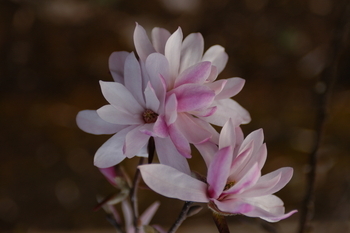 Honoring the great plantsman Don Shadow, this Magnolia is evergreen to -15F. Sweet lemon fragrance white flowers, good tight oval form and dark foliage combine to make it a very good tree. A super hardy selection by Ned Rader that has withstood -35°F though it does drop its leaves at that temperature. The flowers are fragrant and the leaves are darker green than Magnolia virginiana Moonglow®. A choice cultivar of early-flowering, double pink M. stellata. 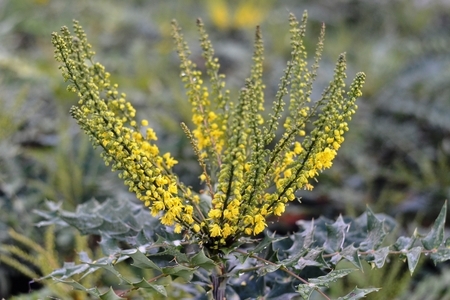 Compact in form, it flowers precociously and the leaves remain mildew-free throughout the summer. 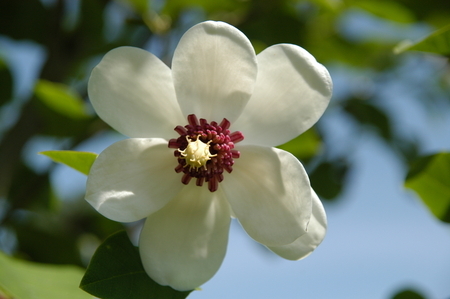 Wonderfully fragrant, frost-resistant flowers on this short, elegant tree means you need one by your own front door. Seedlings of the fertile hybrid, M. denudata x M. liliiflora. Many of the hybrids known and loved are Magnolia soulangiana, the saucer magnolia. 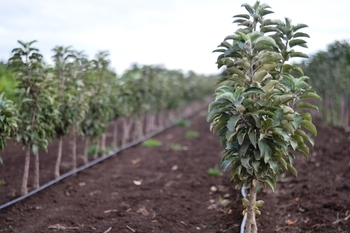 Can be used as rootstock, sometimes preferred (vs. M. kobus) in the Southeast, given its warm and wetter summer soils. Hardier than its cousins and not as tall. It grows to only 1-2 ft., has satin foliage, and is more shade tolerant. An elegant low shrub for a spot where it can be left to spread without irrigation. With its origins on the West coast you might think that is why we are infatuated with this selection but really it is because of its unique attributes. It blossoms later than Charity and has bolder, broader leaves that, unbelievably, are more architectural. Also the flower clusters are a little fatter and shorter. A hybrid of M. japonica and M. lomariifolia. Beautiful across all seasons for its architecturally bold and symmetrical form. Bright yellow late winter flowers. Here in the wet-winter Pacific Northwest, our 'Charity' stock block is totally free of leaf spot that infects M. bealei so severely. 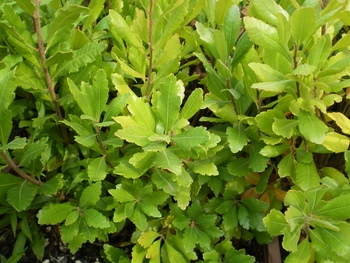 Evergreen shrub with rich forest-green foliage to accent its bright yellow early winter flowers. Upright growth and drought/shade tolerance make this a great focal plant when winter's arrival means fewer possibilities to brighten the garden. Offers bloom succession after 'Charity'. Large golden fruit ripen in October on these columnar growing trees that are perfect for patios and today's smaller gardens. 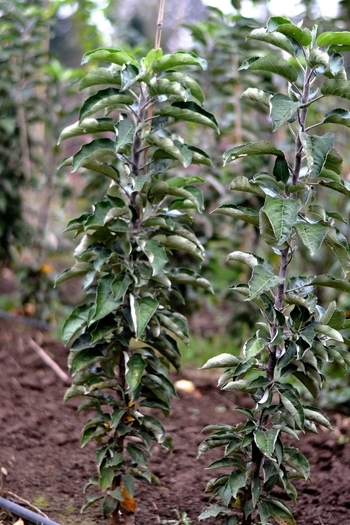 Crisp, sweet, white flesh is found in the very large yellow green red blushed fruit of this columnar growing apple that is perfect for today's smaller gardens and patios. This ancient tree evokes a sentiment of awe when one realizes it has endured change and upheaval essentially in its present form for millions of years. Discovered as a "living fossil" in China in 1941, it prefers a moist, well-drained soil. 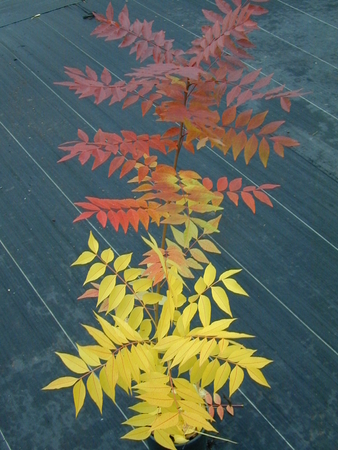 Dawn Redwood is a fast-growing, pest-free and fine-textured conifer, hardy and adaptable. Small to medium-sized shrub with fragrant foliage, often used for naturalizing in states along the Atlantic coast from MA to SC. Famed for its use in making candles using the waxy berries during colonial times, its best present use is as an easy foundation plant, where it will tolerate compact or infertile soils. 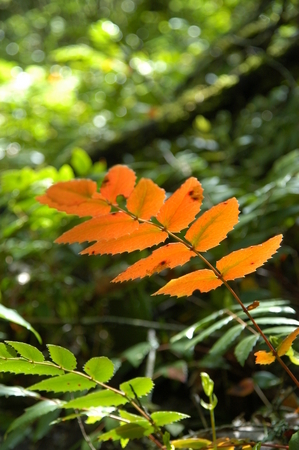 With its brightly colored, shiny autumn leaves and wide range of adaptivity, especially well suited to wet sites. This is a great landscape tree. 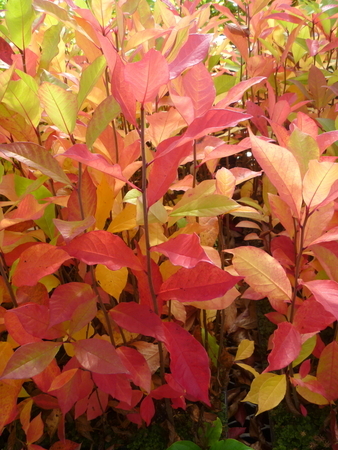 Unlike widely-planted Sweetgum, even seedlings of Blackgum are dependable for fall color. Needs pruning when young. These pot-propagated plants ensure transplant success. What a colorful beauty! 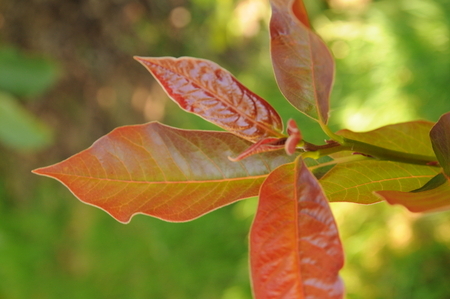 Shiny, burnt orange-red new growth makes this one of the most exciting new Blackgum cultivars. 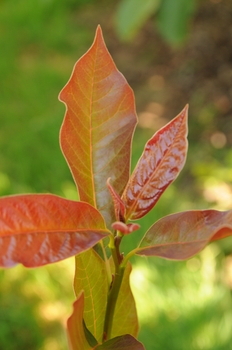 Try some of these easy to grow trees, and save one for your own landscape! 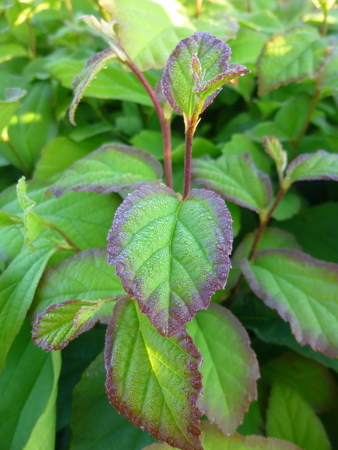 Green Gable is a destined to be a great addition to American horticulture, with notably glossy foliage, beautiful fall color and, due to its dominant central leader, superior pyramidal form. With all the great ornamental attributes of blackgum, including exceptional fall color and ease of care, this selection allows even more flexibility of location because of its columnar habit. 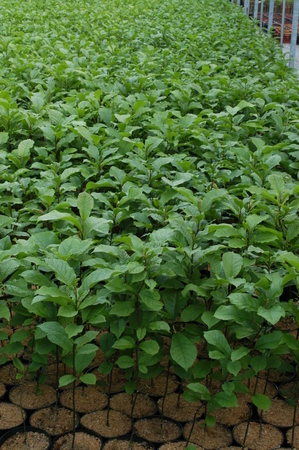 Tupelo Tower™ was selected from a Zone 4 seedling population and is a full zone hardier than other available cultivars. A graceful, slow growing native tree that tolerates shade and grows to 40 ft. tall. 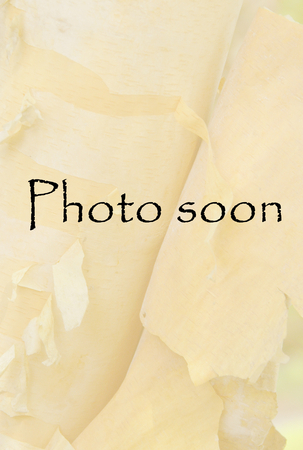 Bark peels in vertical strips. Very easy to grow in the nursery and relatively fast to finish. Pleasing yellow fall color. Exceptional ornamental with handsome glossy summer foliage. 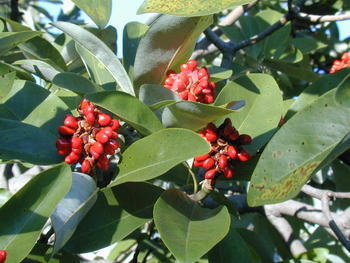 A medium tree that grows to 45 ft., it prefers full sun and an acidic, well-drained soil. Honeybees relish the nectar of the delicate, heather-like blooms, borne on the branch ends like white bouquets in mid-summer. Sourwood honey is a particular delight, so special that it's sold only regionally in the Southeast, and fetches a premium at roadside stands. Oxydendrum in the autumn is a sight for tired eyes, as the foliage shows off rich blends of orange, red and yellow. Essentially the tree form of witchhazel. It naturally becomes a low-branched tree, typically two-thirds as broad as it is tall. 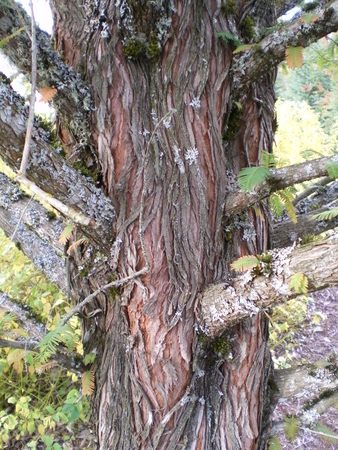 Bark exfoliates on older branches; leaves turn brilliant red, yellow and orange in autumn. With a bit of selective pruning when it's young, but minimal care thereafter, it becomes a medium-sized tree of appealing form. Maroon spring flowers are small, easily missed but attractive, rewarding the curious. 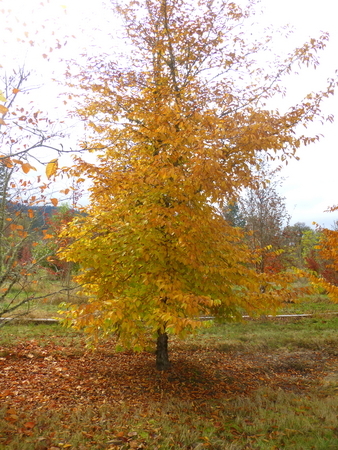 Upright form of a tough small tree that requires almost no care in return for its year-round appeal. 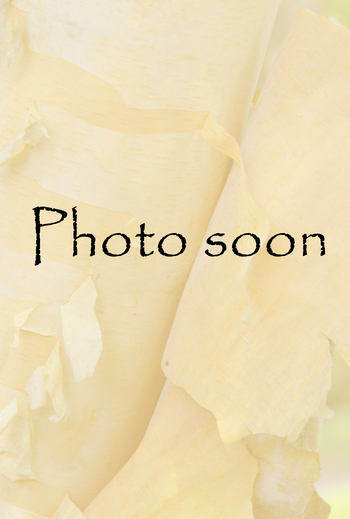 Patchy bark, spring bronze-green foliage, exceptional month-after-month autumn color, and attractive winter branch structure put it into a class that almost approaches the perfection of Paperbark Maple and Stewartia. What it lacks in flower appeal is balanced by its extreme drought tolerance and overall tough character. A superior, tight form that stays columnar and flame shaped over the years. Clean, insect and disease resistant green leaves turn bright golden yellow and red-orange in autumn. Over time the bark handsomely exfoliates. 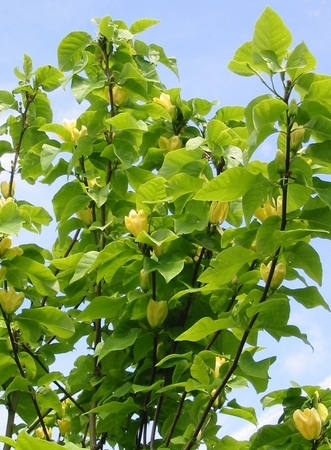 Golden BellTower is a moderate grower and will reach 30 ft. tall and 10 ft. wide over time. 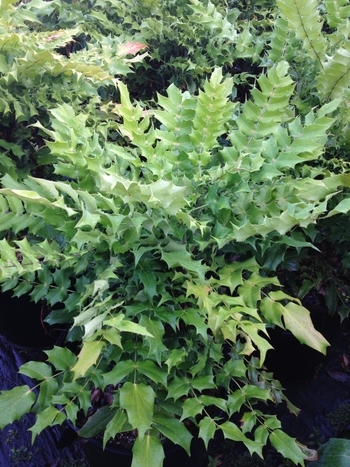 Makes an excellent choice for smaller yards, tight spots and is a logical choice for commercial plantings or as a street tree. 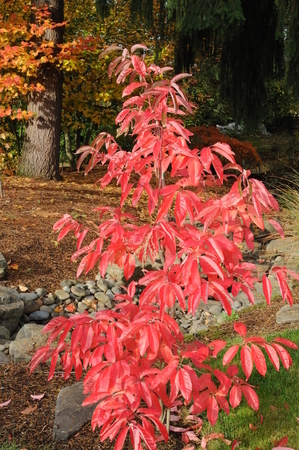 The best fall color will be achieved by growing it in full sun, however it will grow equally well in part shade. Drought resistant once established. Found and selected by our friend Ken Christianson over a decade ago. Pest-free and exceptionally drought tolerant small tree (20 ft.), with excellent red, purple, and orange fall color, even in the Deep South. A logical tree for infertile soils or unirrigated urban sites along streets, in parking medians, or under power lines, where it's tough character will ensure its success. 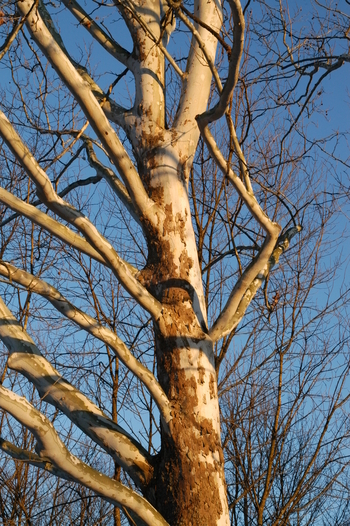 American sycamore is a common sight to many because it was once commonly used as a street tree. Now it is most regularly used for revegetation and roadside restoration projects.